The apparel industry uses specialized industrial machinery suitable for cutting fabric, sewing machines such as single needle lock stitch machine, double needle lock stitch machine, buttonhole machine, fusing machine, storage and packing equipment. The Clothing Industry, throughout its long history - has always been characterized by change and variety, but never so much as today. Until recently, changes in styles of dress were very gradual and a popular fashion could last a long time. Also, the variety of clothes produced were limited to lifestyles and conventions of the day. This situation has undergone a rapid change and the reverse in true today. Due to the conflicting demands of the present market, the clothing manufacturers felt the need to increase performance levels and their productivity by use of highly sophisticated machinery. The apparel industry uses specialized industrial machinery suitable for cutting fabric, sewing machines such as single needle lock stitch machine, double needle lock stitch machine, buttonhole machine, fusing machine, storage and packing equipment. The aim of using this machinery is to reduce handling time produce quality products in less time. An effective cutting room with good cutting machines is the best foundation in any production unit. The major operation is the cutting room is to cut the spread out fabric. This is the most decisive function - because once the fabric has been cut, very little can be done to correct serious mistakes. Power Session: Is often used in the sample room and is used to cut one or two layers of fabric. Round Knife: Is a very fast machine. It is excellent for cutting straight and curved line. Blade size ranges from 4 cm to 20 cms is diameter and the cutting height is about 40% of blade diameter. Straight Knife: Commonly used for cutting and if correctly used is best and accurate for most cutting rooms. Band Knife: The narrow blades allows finest of shapes to be cut very accurately. Some band knife machines have air flotation tables which support the block of work a fine air cushion which helps the worker to cut fabric with minimum disturbance to the layers of cloth. Computer-Controlled Cutting: The marker data it transferred to the cutting unit by means of tapes, floppy discs or directly from the marker planning system itself. This is 6-8 times faster and produces an accurate cut component. Although costly, initially it is the best investment for large scale production. The clothing industry requires special sewing machines for sewing a wide variety of garments. Specialized sewing equipment for their own particular requirement is a basic necessity in the garment manufacturing unit. Functions at a high speed of 6000 rpm. 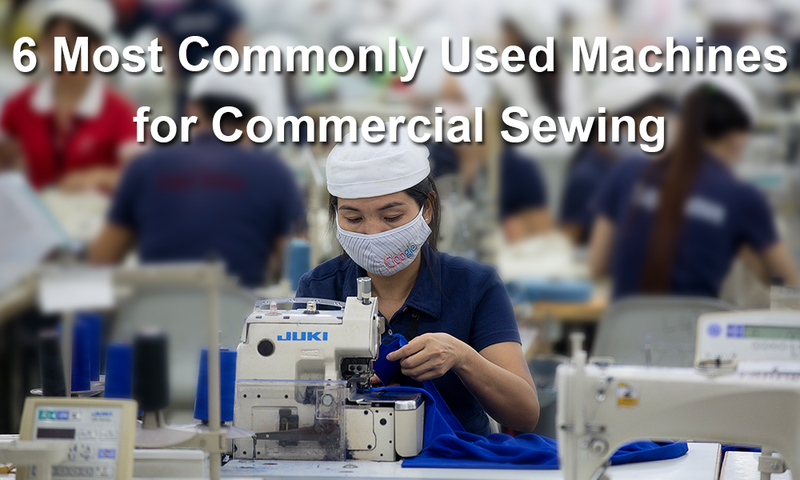 Has several special sewing machine attachments which can be used to help the operator maintain a consistent standard of quality particularly when stitching collars, cuffs, yokes etc. Works with electronic controls at a high speed of 6000 RPM. The machine consists of two needles which function together. You get double rows of stitching in a single operation. Used particularly for sewing jeans, safari suits etc, where double seams are required. Produces quick and uniform stitches and thus saves production time. This name is given to this machine as it stitches the edges of a garment to be finished. It covers rough edges of a fabric in order to present a clear and neat appearance where seam edges are visible. It speeds up to 8500 rpm and does automatic edge trimming and thread clipping. It is also used for assembling knitted articles such as T-Shirts. This is also a high-speed electronic machine. Buttons with 2,4 holes or shanks can be sewn on the same machine by simple adjustments to the button clamp and spacing mechanism. The needle has a vertical movement only and the button is moved from side to side by the button clamp. Each machine has a maximum number of stitches. i.e.16, 24 or 32 and can be adjusted to sew the few or half the stitches i.e. 8 or 16, 12 or 24, and 16 or 32. Generally decorative buttons can be sewn with half the number of stitches used for functional buttons. This is a very expensive machine. The machine automatically slits through the garments and sews around its edges to prevent fraying and stretching. The number of threads used depend on the garment type and quality. In standard types of garments such as shirts the operator simply positions the work in the machines wherever button holes at predetermined distances which the machine automatically stitches and trims the thread ends. There are several kinds of fusing machines ranging from small table models to large floor standing machines. Basically, this type of press consists of padded top and bottom bucks with heating elements in one or both of the bucks. The bottom buck is static with the top buck raised or lowered to open or close the press. Relatively speaking, fusible interlinks are precision products and it is essential that they are fused on correct equipment. Under strict temperature control. The duration of time required is also programmed. During fusing, it is necessary to apply equal pressure over the component to ensure the following factors. Intimate contact between top cloth and interlining.